Aloha! I know most of you are probably out braving the crowds this weekend, but for those of you who are surfing the internet I have some fun and deals for you. 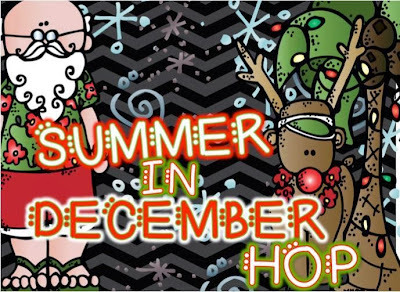 My wonderful blogging buddies from The Primary Chalkboard have put together a fun Summer In December Hop for you. We have lots of freebies for you to use now or later in the summer months. Just click on the picture above to take you to my Facebook page to begin! I am also having a sale in my store today and tomorrow for Black Friday. I know the Cyber sale begins on Monday, but I know it would be nice to prep this weekend. Everything in my store is 20% off, except for my Daily Deal. My Aloha Math Centers will be marked down to 30% for today only. So stop by and snag them up! Now I am off to do some Cyber shopping of my own!